In order to progress my project I've decided not to home brew a chassis but follow Kurts Midlana book. I primarily want a road car but would like to hill climb too. Firstly what class would a Midlana fall into Sportslibre?? Secondly the main roll hoop has bends to taper in at the top, as I understand it this isn't MSA compliant. Could I just have a main roll hoop with straight risers in the correct material? Yes, sports libre for a non production road car. I think the taper is ok. But the front roll bars need to either go up along windscreen then turn horizontally and run across the top of the windcreen to create a front roll hoop. Then have 2 independent bars linking front and rear hoops. Alternatively 2 latteral bars that raise inline with the screen and reach the top of the windcreen then bend to horizontal and go back to the top edge of the rear hoop, roughly parallel with the side of the car. Then you need one independent bar linking the two latteral bars across the top of the screen. Either the red and yellow route. Or the blue and green route. The blue book describes attachment methods requiring reinforcement plates. presumably these arent required when the rollcage hoops are integral to the chassis?? You just need the rear hoop and stays for hill climbs and sprints. If it is just a rear hoop and stays then it needs to be 50x2mm CDS. With a full cage, I think you can reduce slighty in diameter. But better to check with a scruntineer. Sizes are the same no matter what. To clarify I want a cage rather than just the minimum requirement of a rear roll hoop for Sports Libre. 1. The only bends allowed in the rear roll hoop are the top corner bends as in the Blue book section K drawing K1 to K8. Which would mean the rear roll hoop shown in the picture above would not pass scrutineering. 2. Do you need to include reinforcement plates if the "Cage" is integral to the chassis. 'The vertical part of the main rollbar must be as straight as possible and as close as possible to the interior contour of the bodyshell. Best thing to do is email a drawing of your proposed ROPS and photograph of the chassis with details of tube sizes and spec to the MSA technical dept for the attention of Michael Duncan. Doing that will get a definitive answer. Sports Libre requires a full cage. If you are competing in Specialist Production (where the road tyre kit cars are) or Modified Specialist Production (where the slick shod kit cars are) then a roll hoop is sufficient assuming the engine is under 2lt. I suspect the rear hoop is non-compliant. What diameter is the tubing as it looks small? I wonder how the playskool /westfield/caged full cages pass that then? As they have a bend at the bottom of the rear roll hoop angling it out slightly. The Westfield, Playskool and Caged Bars are all Homologated designs. This allow them greater flexibility in their design outside the constraints of the blue book. 'The vertical part of the main rollbar must be as straight as possible and as close as possible to the interior contour of thee bodyshell. I wonder how the playskool /westfeld/caged full cages pass that then? I have to confess the picture is not my chassis its Kurt Belinskis about which he wrote the midlana book. I'm trying to clarify the MSA rules in order to modify the design enough to be compliant when I start my chassis. As built Kurts roll cage is not compliant as its built with 1.5" tube. Isn't there a road-going sub category of Sports Libre? Becaus OP indicates that the car will be road legal, just because it isn't build in sufficient numbers does that automatically requires a full cage. You dont need a full cage to pass the IVA (yet) . Not that I argue against having a full cage, but to get clear what is minimum required vs best practice. This is Kurt Bilinski, designer of the Midlana car in question. In short, car design is a series of compromises. The OP is pointing out valid concerns if his car will be used in competition in England. The Midlana book is actually more of a design guide that an outright "do it only this way" recipe - I doubt any two Midlana cars will be identical. Several pages are devoted to alternate roll cage designs, pointing out the benefits and issues with each. 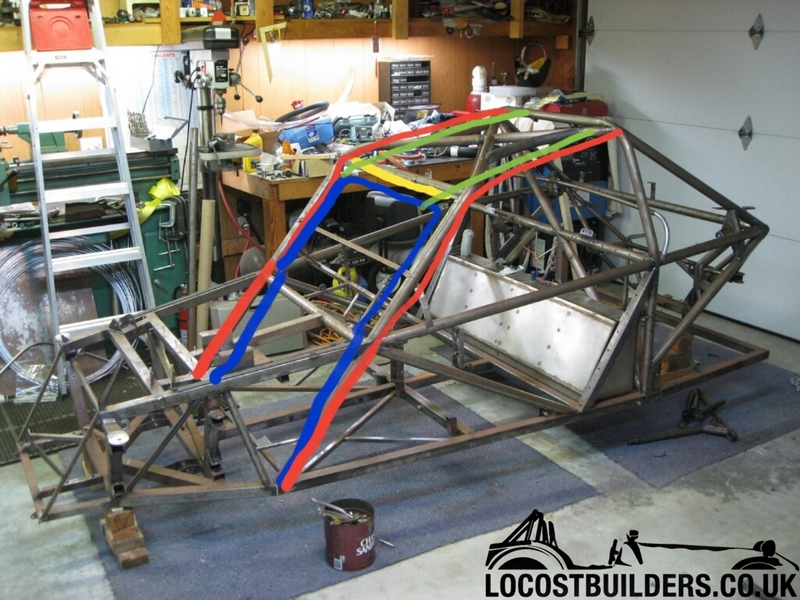 While the above roll cage suggestions result in the strongest chassis, it's also results in a car that's the most difficult to get into and out of, something that's important for road use. Regarding roll cage tubing size, I used the SCCA rule book (the US's version of the MSA) to come up with the 38 mm tubing size. This, too, is noted in the book, that if someone's looking to compete with the car, they should check with the local regulations first, as the OP has done here. Cheers, and good to see another builder - please consider starting a build log on the Midlana forum! I have both your books thoroughly enjoy reading them. Your standard of writing is second to none! Your observation is quite correct. I know I will need to modify the roll cage details. I am trying to ensure the roll cage element is compliant with our MSA "Blue book" rules before I build a vehicle I'm unable to compete with. I registered on the Midlana forum a few days ago so will be starting a build log very soon. I know your post was a few months ago (I've not been on here for ages) - did you make any progress with your cage / chassis?